This is not the case in the long run. By listening the deal is won. Next week I’ll be attending the the National Sales Conference hosted by the Sales Association. I attended one of these events in Chicagoland last fall and was extremely impressed by the speakers and topics. I was able to share with peers, who like myself, struggle with sales and sales management. I was also able to pick up a number of new skills and strategies that I applied immediately. Please leave a comment if you’ll be attending. And tunes their presentation accordingly. The sales process is crafted as needed. I was talking to two car dealers this week and wanted to buy a car from one I had previously done business. I was sending both of them emails to get the best price, yet this dealer never responded. A different dealer was constantly following up, giving me information I requested, asking me to visit for a test drive. I appreciated their efforts. So much so I visited last night and they sold me a car. This was from the post Follow Up. 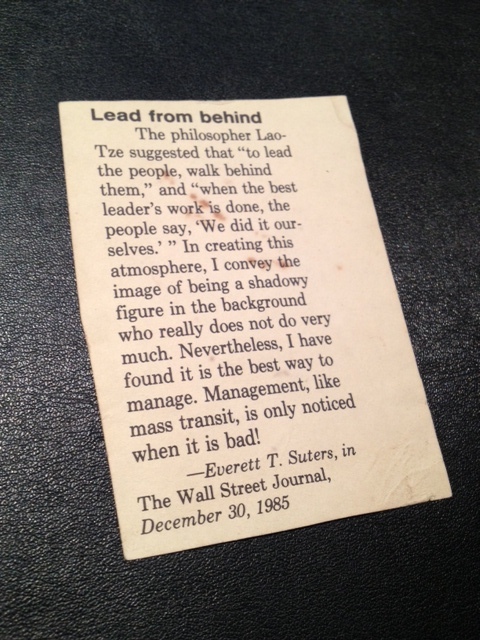 This week I came across one of my first exposures to the Tao, a clipping from the Wall Street Journal. At the time I was a lead software engineer for cellular networking features at Lucent Technologies. My team consisted of a half-dozen engineers of multiple age, experience, and ethnicities. It was a new challenge, and a challenge it was. One of the team members, Serge, came up to me 6 months wondered why I was not “on his case” everyday and why he let some team member struggle and not just order them to do it my way. I showed him the clip and he smiled. From then on he understood this management approach. All of the code written on that project looked like I had personally coded it. It had my style and beliefs in both comments and design. But each member thought they had “did it”. They took great pride and responsibility for their part. In the end the project was a success and deployed to a large Toll Switch (long distance) in London England called Mondial. It was on this project I was awarded two Patents. Lao Tze’s teachings about management can be well applied to the management of sales accounts. A Master Seller leads from behind, delving deep into the needs of the prospect, discovering their pain, crafting a solution that might work, coaching the prospect into being a buyer, and soon customer. This leading from behind is true leadership. And when done skillfully, the buyer hardly notices it. A few months back a blogger named Amy Putkonen reached out regarding my blog the Tao Te Ching of Sales. She had once written a post on the intersection of marketing and Taoism and believes the two are a terrific match. She was excited to see a new blog solely dedicated to sales, marketing and the Tao. She kindly asked me to guest post on her blog and today it was published here: Tao Te Ching Daily Guest Post. I wrote about discipline in sales. She kindly writes “the concepts of selling can be applied in all areas of life and business and are good for everyone to know.” I truly appreciate her kindness and urge you to visit her blog the Tao Te Ching Daily. She has been creating a version of the Tao Te Ching and discussing it at great length with a wonderful set of readers. I find her very perceptive and skilled at making the unclear, clear. 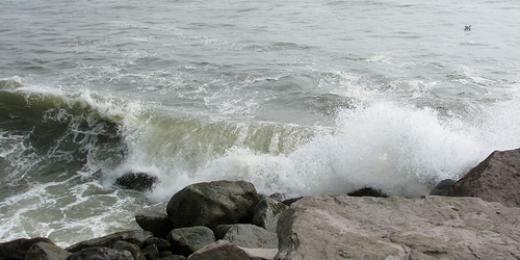 Again you can visit Amy’s blog the Tao Te Ching Daily or you can follow her @amyputkonen on Twitter. Sales is a process of becoming. They are constant in flux. Shaped by deals both won and lost. For new deals yet to come. A vendor here to help. Spoon feed the details slowly. You can’t address to completion. Lest the listener gets bored. Can overcome the hardest Gatekeeper. Thought I would stop by. Here is some information, you may find of value.